So what annoyed me this week? 1) The Weather. Couldn't winter be warmer? At least we are now past the shortest day of the year, but I'm over it, so flip-off cold weather and roll on spring. 2) Technology. Am I a techno midget or is there a gremlin about? There I am trying to impress and become an A Lister with The Bloggers Concierge and do you think I can work the linky link? So I totally embarrass myself running around asking about fixes and am mortified in the morning when I discover I've managed to link in twice myself and once more with help. Must have looked the real novice that I am. So flip-off technological challenges, I'm over you. 3) I'm a bit over some of the people I find on some of these links. In my opinion "too much floggin' and not enough bloggin'". I mean, I don't mind ads, I have some, but if you are going to join in these great blog-hops at least join in the spirit and give the organisers some credit, because it's due, and post as requested. So flip-off if you are only floggin'. 4) To the pumpkin soup that exploded all over me - flip-off big time. I ended up with very minor burns and a great deal of embarrassment. The heat was only gentle and I was grating in some ginger, when "pop" you gave "Old Faithful" a run for her money. Pumpkin on hand, face and in hair. Just not funny! (well not from my side). 5) That gushing oil. I can't even talk about it this week. Friday High-Fives, courtesy of Lisa at Jarbo Jabber. I love the idea of ending on a positive note and Lisa has kindly allowed me to use the concept and her groovy Friday High-Fives badge. Thanks Lisa. Now if I could just get it to centre - hmm what was flip-off number 2 again? Ah forget it, I'm feeling much better now, so on to the positives. 1) Just love these guys who have come up with a simple way to clean up all that oil. Straw! Yes Straw. The video has to be seen to be believed. Let's hope the powers pick this up and use it as it seems to me to be clean and green and fast. Thanks to DJ Kirkby at Chez Aspie (Don't miss her Wordless Wednesday competitions - the photos to caption have to be seen to be believed and then there's "Without Alice"). for passing on This link to the oil solution video. Big high fives to you DJ and the oil solution guys. 2) To Mis @ Miel et Lait and http://kludgymom.com/ for setting up a new blogging community, The Bloggers Concierge. You have until the 28th to join in the A List offer they are making. Check it out at The Bloggers Concierge or check out My A List Post. High fives guys, great idea. 3) To my lovely man. You are a star this week, with all the work, talking, understanding and love. High fives to you. 4) To my new Prime Minister, Hon Julia Gillard. 48 and our first female Prime Minister. Thanks for breaking through the glass ceiling of politics! 5) Forgive me I'm going to indulge. High fives to me - just past 40 postings on this blog and am almost at 30 Google followers. I'm happy with that after just a couple of months. Thanks to all who follow and those who drop by for a read now and then, I appreciate it. love your flips this week Cheryl! Your techno problems always crack me up :) You'll get there, don't worry!!!! and thanks for the many shouts out...you're a doll! The oil thing is just depressing. Period. I wish I could help you, but I'm the least technologically savvy person you'll ever meet! You are doing great girl. First on the list. I'm beaming over here for you. Seems to me you're getting this technology thing figured out just fine. So strange that you are having winter. Hard to wrap my head around. The one about your man is super sweet. And I also love TBC. Great idea they came up with. They are brilliant. First time here and blog hopping - nice to meet you! You have winter over there and we should have summer here in Casablanca but where's the sun?! I'm sorta embaressed to admit, I don't know what "floggin" is! AH! I hope I don't do it! I don't wanna get flipped off:) I agree with the oil, can't even go there. Beyond terrible! I love that you add a positive spin on this too every week! Great flips fellow flipper! I'm happy to say that I'm your 30th follower! Oh, the oil spill is making me so mad I can't even flip it off! Hey everyone, thanks for stopping by. Chana "floggin'" hmm probably an Aussie term for selling. I just feel it's a bit rude when people link in wihtout posting or acknowledging the link starter and take you straight into a sales site. Linda, bless oyu, wonderful to have my 30th follower and 40th post - I'm glowing! Thanks for all the compliments and I'll be working hard to include content here that's worthy of the support. thanks for mentioning me! love seeing the flips then the positives of your week.....hope others start doing it even if they don't use my pic! have a good one. Nice to meet you!! I also hate it when people don't follow the memes instructions!! 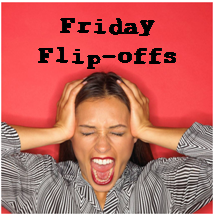 I posted flips on Friday then "Tip of the Hats" today..(On Everyday Bliss Blog - I have two blogs). cause I just couldn't leave things on the negative... I like your high fives idea!! ANd I like your blog so I will be following!! Thanks for the kind remarks on my A list post. Blush, blush. Have a great week.